Big Shots at FlyCasino is a 6-reel, 4,096 ways to win game with new symbols arrangements. The main attraction is the Free Games feature where up to 10 free spins can be won with no lower value symbols in play – you can win up to 25,600 times your bet! A little hard to get, but when you do….BIG WINS can await. Featuring luxury yachts and boats, symbols also include hearts, diamonds, spades and clubs as well as 5. The diamond symbol is the wild and can substitute for all symbols except the Free Games symbol. Big Shots is unique for big symbols which appear in a variety of sizes – up to 4×4 in size. This helps you create various winning combinations. To get a win, you need to land the same symbols on adjacent reels. (No lines). 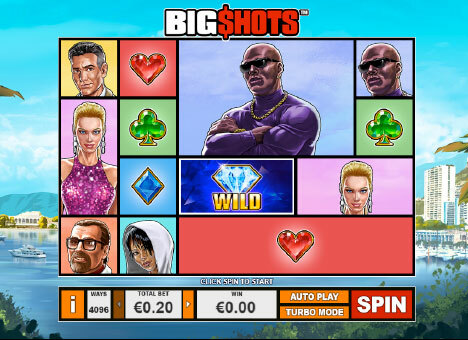 Like most slots, Big Shots is all about the Free Games feature which is played when you get the Free Games scatter (all 5 characters together) filling reels 2 through 5 (the middle reels). If the scatter appears partially, it can nudge up or down to trigger the feature. During the feature, ONLY character symbols appear. Free spins can be re-triggered once. Please note, that our Download version will have this game in about 1 week. $40 Gets $60 X 2 Bonus on Sunday from 00:00GMT until 23:59 GMT, all members on their deposit of just $/£/€30 or more will receive a $/£/€40 bonus. Claim it 2X. $225 Monday! From 00:00GMT until 23:59 GMT, all members on their deposit of $/£/€30 or more get a 75% bonus up to $225. $250 Big Money Tuesday! From 00:00GMT until 23:59 GMT, all members on their deposit of $/£/€30 or more will receive a 125% bonus up to $250.00.